Sabellaria alveolata is a widely distributed Lusitanian species, extending from Scotland in the north, to Morocco in the south. The shores of the British Isles and France currently host the greatest abundance, but studies are or have been carried out on honeycomb reef worms in Portugal, Spain and Italy. Honeycomb worm presence at the level of the fucoid (Fucus vesiculosus) belt, on an exposed shore. 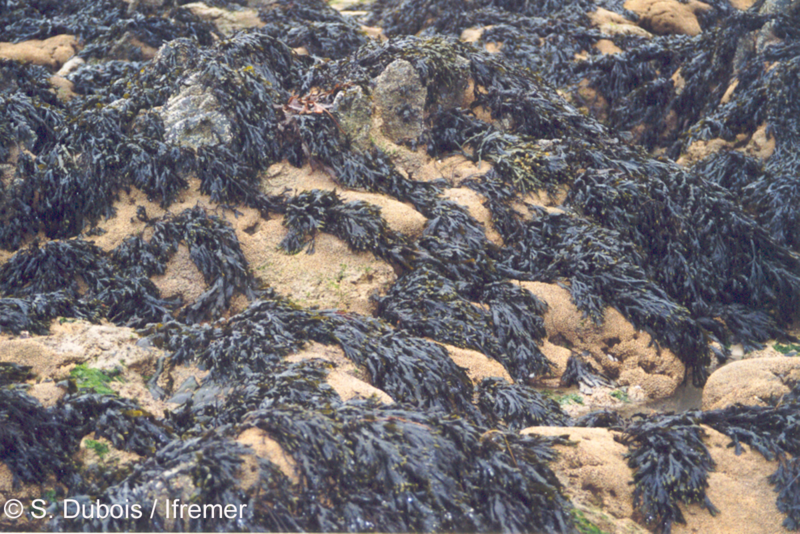 Along the rocky shores of the English Channel or Atlantic coast, its presence can be quite discreet, where a few tubes can often go unnoticed amid the bladder wrack (Fucus sp.) which covers them at low tide. Occasionnally more imposing structures are reported by local beachgoers, but with the exception of the United Kingdom and Ireland, no detailed map for Sabellaria alveolata reef exists. The largest biogenic structures - which can quite unambiguously be referred to as reefs - can be found in France, along the stretch of coast between Normandy and the southern Loire estuary. Brittany, which hosts the largest Sabellaria alveolata biogenic structures, has many stretches of rocky coastline with more or less significant crusts or veneers. 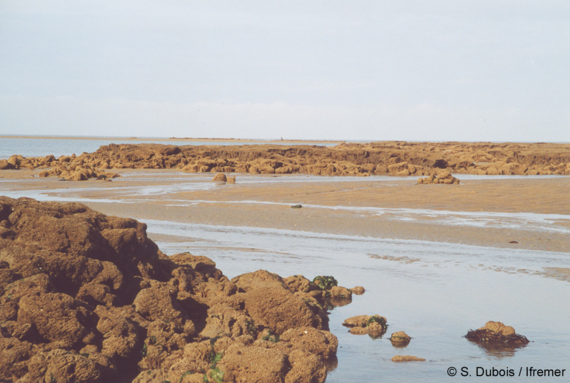 Only two places are known to host reefs on consolidated soft substrata: Barbâtre (Noirmoutier Island, Pays de la Loire) and the Mont-Saint-Michel Bay (Brittany) where the reefs cover dozens of hectares. The Mont-Saint-Michel Bay contains two honeycomb worm reefs; in the centre of the bay, Saint-Anne reef, which stretches over roughly 100 hectares, and Champeaux reef, which covers a few hectaires in the eastern part of the bay. The Sainte-Anne reef is the largest biogenic construction in Europe, and as such constitutes a unique natural heritage. 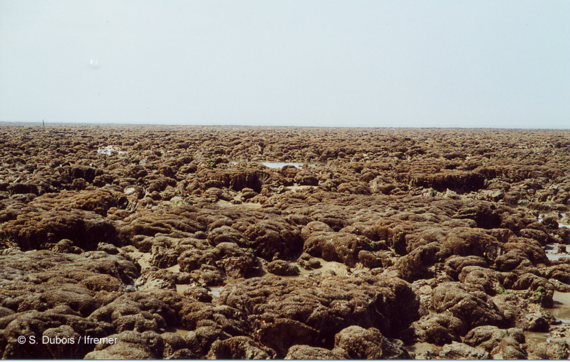 The reefs of Barbâtre, Noirmoutier island, which have formed on soft substrata. The landscape at Saint-Anne honeycomb worm reef (Mont-Saint-Michel bay) which stretches over 100 hectares.